The Vela (meaning "watchman" in Spanish) series of spacecraft were designed to monitor worldwide compliance with the 1963 nuclear test ban treaty. The satellites were so successful, each operating for at least 5 years, that a planned acquisition of a fourth and fifth pairs was cancelled. Instead, TRW was awarded afurther contract in March 1965 for an advanced Vela spacecraft series. The Vela series was the first spacecraft procurement to utilize a fixed price incentive contract. The spacecraft were spin stabilized at 120 rpm. 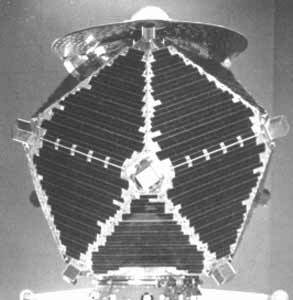 20-sided polyhedrons with body mounted solar cells generating 90 W. During launch, 2 satellites were connected by a central cylinder containing an apogee motor. The payload consisted of twelve external X-ray detectors and 18 internal neutron and gamma-ray detectors. The third pair (F5, 6) carried an improved detector package, including an optical nuclear flash instrument.